The restaurant of the Hotel Sirmione e Promessi Sposi: pleasing to the sight and the palate. 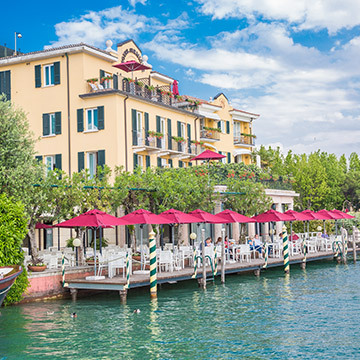 In the lively atmosphere of the centre of Sirmione, overlooking the main square and alongside the jetty, the Poets’ Restaurant is the perfect setting for lunches and dinners on the lake. The room, large and sophisticated, is enclosed with large windows. Outside, the tables are arranged on a terrace and a jetty next to the water. The cuisine, offered both to hotel guests and non-guests, including in the afternoon, is made from fresh, selected ingredients and is the work of the chef Cristiano Aldegheri. 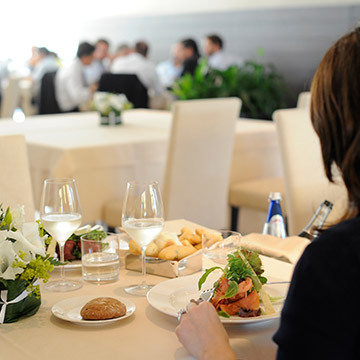 The menu creatively interprets the typical dishes of local tradition; among the most classic offers are some four-star dishes, for gastronomic experiences of the highest qualiy, always in line with the recommendations of Dr Anna Villarini, a biological nutritionist who applies the most authoritative nutritional recommendations. To spoil the guests, there are also two bars: one indoors, for a coffee or a drink next to the swimming pool, and one outdoors, for a relaxing aperitif after a long day in the spa. The combination of thermal wellness with the pleasure of taste.